9 days to go, or is it 3 months, 9 months, 2 years? With just 9 days to go until the technical ejection of the UK from the EU, we still have no idea what the UK government is up to. Will PM May opt to get her now thoroughly discredited draft bill through parliament a third time, using the cliff-edge as leverage, and noting the alternative for a long Brexit delay as the alternative? Does she do this merely to avoid the anger of some of her cabinet, who would prefer no deal to no Brexit? Or will she try to find ground which has more support, a softer Brexit perhaps, or go back to the people in a second referendum? Short answer...we don't know. We don't know if PM May knows. That's worrying. EURGBP seems oddly becalmed at about 0.855. Something's gotta give. My patience with all of this most likely. As well as some trade tension creeping into the US-China trade talks, which is giving markets a few jitters today, concern is mounting over what will happen to the Fed's dot-plot diagram due out after Thursday's FOMC meeting. With markets pricing in some chance of cuts in 2019, will squeezing out only one hike in the 2019 dots be enough? Would removing the implied hikes altogether look as if the Fed were throwing in the towel and spark a panic? There are a number of possibilities here. But remember, markets price based on weighted probabilities, so what's priced in currently in Fed funds futures isn't so different to the dot plots, allowing for some low outliers. 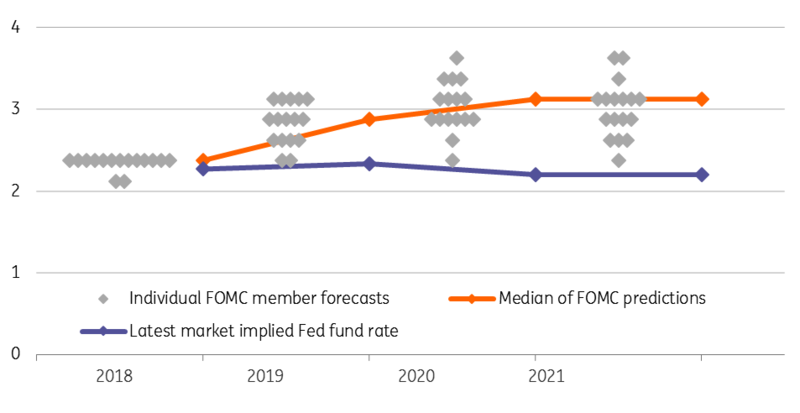 I think the market can cope with a conservative shift down in the Fed member projections that still leaves one hike in place. After all, they would look pretty silly if they took out all hikes this year, only to have their hand forced later in the year by some pick up in growth or inflation.